to remember where it is on a map, is that if Italy really was a boot, Albania would get nicked by the heel on the back swing. Now that’s settled on to the food! I had a little trouble, not for the last time I’m sure, finding a dish that was Albanian specifically. So many empires and countries have controlled the areas in and around Albania for so long, it is unsurprising that a national culinary identity might be difficult to pin down. Under Roman and then Byzantine control for hundreds of years, this was followed by incorporation into the Ottoman Empire in 1431. Independence was not recognized until 1913 and only lasted for a scant few years before Italian and Nazi occupation during the Second World War. Following the end of the war and some power struggles, Albania was a communist state until 1992. This turmoil left little time to develop a citizen based culture in which food could be explored. Much like other countries in the area, they use fresh vegetables and rely on olive oil heavily. 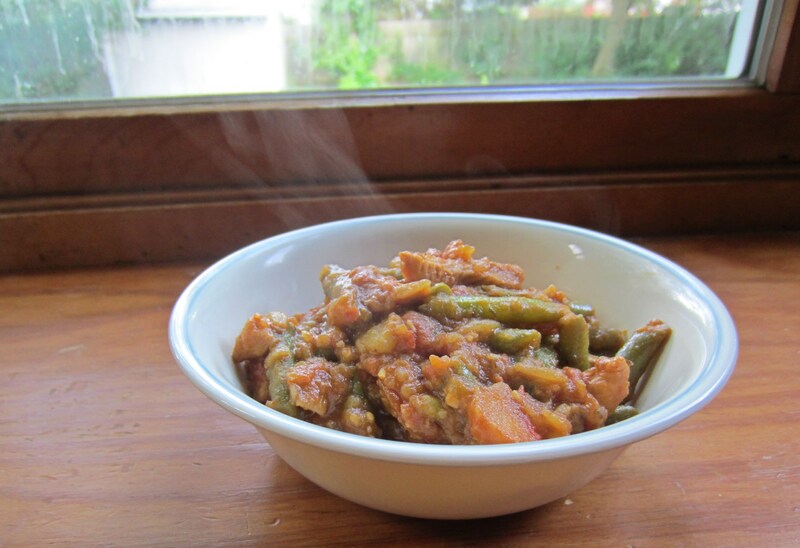 I settled on a simple green bean stew which reminded me very much of Italian and Greek cuisine. 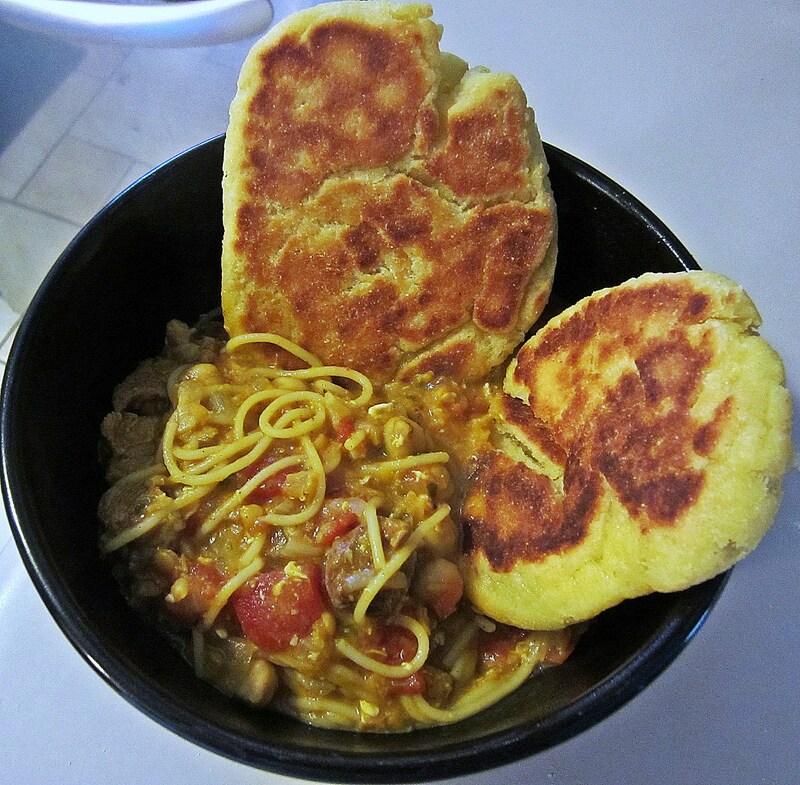 This one pot stew is incredibly easy to make and very tasty. There are two flavors which really stand out and give this dish a unique punch. The use of liquid smoke adds a wonderful aroma and flavor without the need to fire up the charcoal. The hero of the dish which separates it from other Italian and Greek preparations is the use of Paprika. It is not uncommon to have it sprinkled on dish of humus for example as an accent, but I rarely find it playing the lead role in seasoning. This trait is more common in Hungary and Romania, which is actually not that surprising, as they are situated only one country away from Albania on the other sides from Italy and Greece. 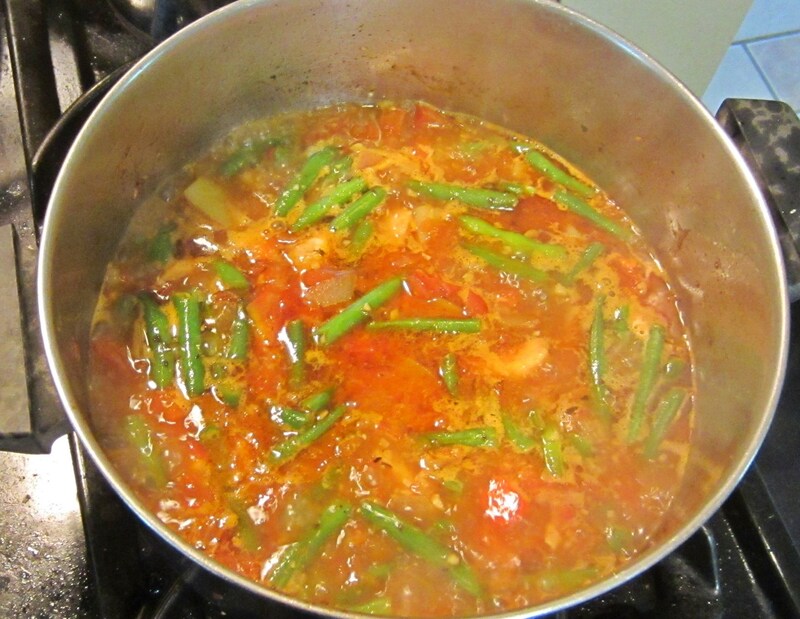 This stew comes off as almost a thinner, more tomato based goulash, but the green beans playing a lead role keeps it lighter and fresher, more like an Italian dish. You can cook it down to the thickness you prefer and can serve over rice or bread if wanted. I usually only look to green beans as a nice side to pair with a main course but they really step up making this dish healthier. I would absolutely make this dish again, it is fast, easy, tasty and would be a perfect entree anywhere from late summer through early Spring. 1. Heat a medium pot over medium heat with 1 tablespoon of olive oil. When hot enough, add the chicken and saute until golden on all sides about 4-5 minutes. Towards the end at the liquid smoke and Smoked Salt. Remove from pot and set aside. 2. Now add about 2-3 tablespoons of Olive Oil to the pot. Add the onions and saute for a good 8 minutes until they are translucent and tender. If your pot has burned pieces, deglaze it with a bit of vegetable broth. Add the garlic and saute for a minute until fragrant. Now it’s time to add the green beans and potatoes. Saute the green beans and potatoes for about 5 minutes. 3. Now add the tomato, paprika, oregano, chili flakes and season with salt and pepper. Saute for another two minutes. Add the vegetable broth or water and bring to a boil and then to a simmer. After a couple of minutes add the chicken that you have set aside. Simmer the stew for about 45-50 minutes until the green beans and potatoes are tender. If the stew starts to get dry simply add some more broth. Re-season with salt and pepper to taste if necessary. Let the stew sit for 15 minutes or you can eat it has soon has it finished cooking. On our alphabetical tour around the world, our first stop is in Afghanistan. I am woefully ignorant about this country despite the notoriety due to its involvement in the vast global terror situations over the last 15 years. A dish called Kabuli Palaw is the national dish of this embroiled country, which actually is a simple and yet unique pilaf. 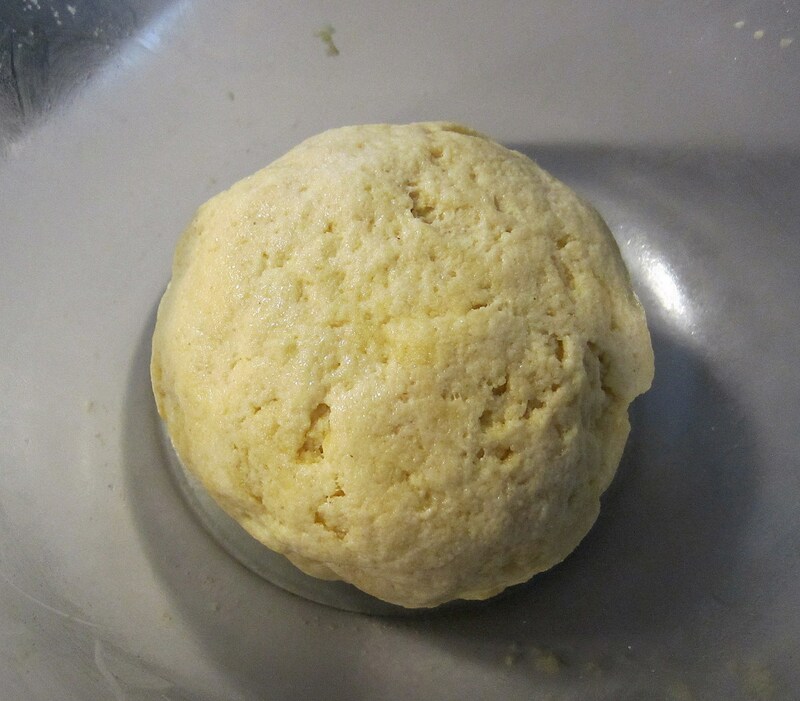 Although I did my best to adhere to a conglomeration of various recipes, I did make adaptations when necessary. I did not, for example, have any saffron as I am working with an average budget. The assembly of the dish was very easy if everything is measured out ahead of time (which is always a good idea). I am an unapologetic onion worshiper, so another small change I made was that I did not discard the onions initially cooked with the chicken to make the broth. Although much of the flavor is given to the broth, I still feel that the boiled onions lend sweetness (I always cook with sweet onions) to the dish when added back into the pot and browned with the separate onions for the sauce. You can add just some of those onions or none at all; it is completely dependent upon your preference for onions. I will say that in the final product they are indistinguishable as onions and simply thicken the end result. The boundaries for my wife and I that this dish pushed were very different. For her, adding raisins to a savory cooked meal was not something that would normally appeal to her. As well, the fried-then-baked carrot matchsticks were also outside of her comfort zone, as she tends to prefer carrots soft like in a stew but not falling apart. Whereas it was a matter of ingredient texture and the savory/sweet dichotomy for my wife, my battle was with one simple ingredient: cumin. For most of my life, up to this day, I have long struggled with Mexican and Indian foods. I want to like them, but there is always one flavor that has put me off for years, eventually I pinpointed it to cumin. I deliberately picked a recipe to begin my task that contained my greatest spice adversary. In the end, when balanced with the other spices and in a reasonable quantity, I had very little problem with that unique flavor effecting my opinion of this dish. Would I order it in a restaurant prepared by someone who knows the dish backward and front? Very possibly, and I certainly have a better appreciation for cumin as well as the assembly of this classic pilaf. Arid desert and dry mountain climates get unbearably cold and this dish would certainly keep you warm with its rich earthly taste and hearty texture. Next up…Albania. 1. 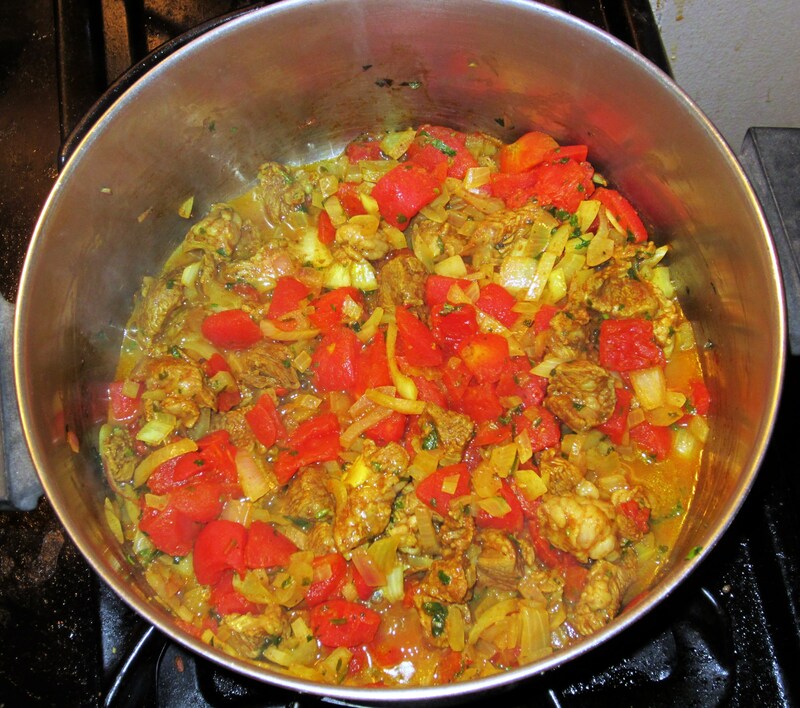 Place chicken , onions and hot water in a large pot. 2. Cover and simmer for about 1 hour. 4. Remove chicken, reserving stock & discard cooked onions. 6. Cook rice via instructions to just before done (~ 8 minutes). Set aside in a pot until ready to assemble. -Brown onions in butter and remove from heat. -Add cardamom cumin, freshly ground black pepper & saffron liquid and mash with onion to form a paste. -Add about 3/4 pt of the chicken stock; simmer for 5 minutes and taste for seasoning. 8. Combine cooked rice, stock sauce as needed and chicken; place in a buttered casserole. Cover. 9. Fry carrot matchsticks in 1/2 tbs butter and add raisins to them at the very end. 10. 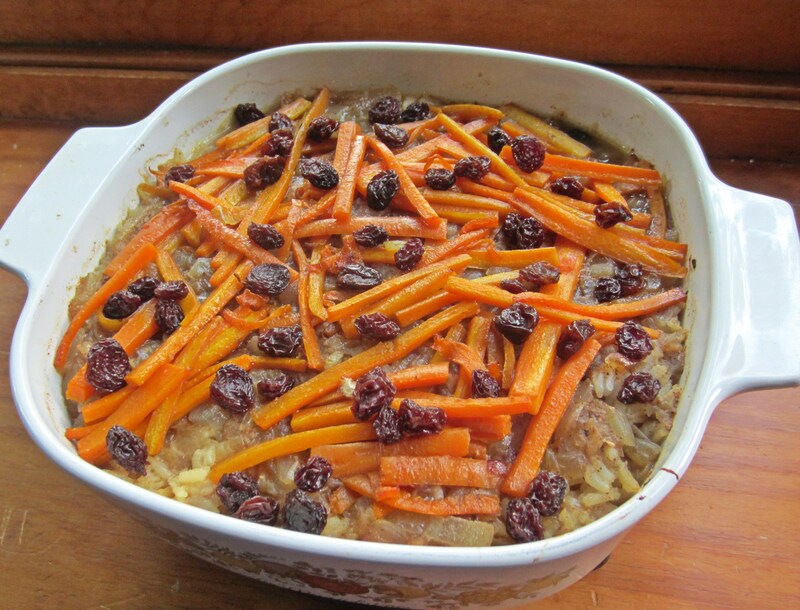 Sprinkle partially cooked carrot matchsticks and raisins on top of chicken and rice and cover tightly with aluminum foil or cover. 11. Place in oven for 35-45 minutes until desired thickness is achieved. Two things happened to me recently which impacted the way I think about food. 1.) 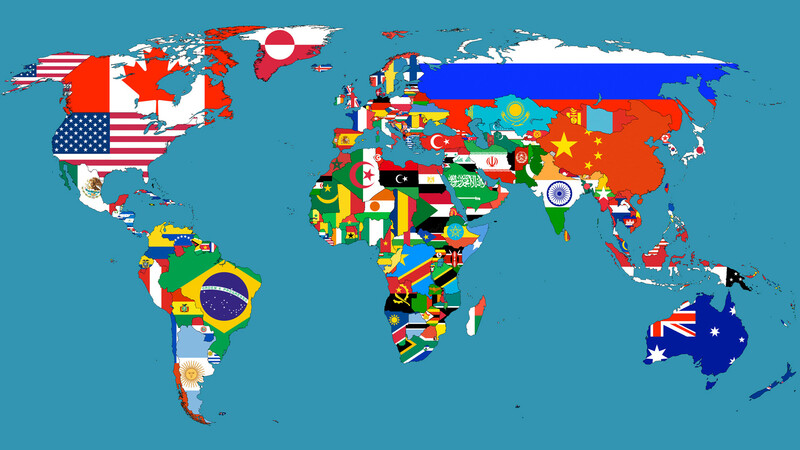 I traveled far abroad and remembered how much I love the food and cultures of different societies around the world. 2.) While watching an old episode of Masterchef, I saw the best home cooks in America utterly fail at making simple Chinese Food. From the meaningful to the meaningless, these two experiences made me want to do something to expand my culinary encyclopedia. Therefore I am taking on the daunting, yet fun task of cooking one dish from every country in the world…in alphabetical order. I hope this will challenge my technical cooking skills as well as my palette. I will be posting pictures, recipes, and thoughts as I go. So please join me if you would like and maybe we can learn some things together.